You've got to love HTC. While everybody else in the world is trying to make ever more powerful smartphones and tablets, HTC has decided that what we really need is a periscope. 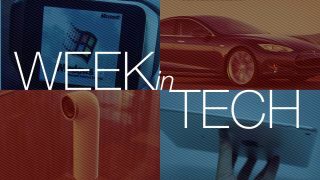 But it's no ordinary periscope, and this is no ordinary week: we've got spy-proof tablets, Windows on your wrist and the next generation of Google's Nexus tablet. HTC's reinvented the periscope and called it the HTC Re. You don't need to live in a metal tube with lots of men to want one, though: it's designed as a GoPro rival and the ultimate selfie snapper. As Marc Flores explains, we'd rather see HTC Res than iPads above people's heads at gigs. HTC's also made some phones and tablets. We pit the HTC Desire Eye against the HTC One M8 to see how it fares against the flagship, and we've also found out about a little something called a Nexus 9. There's bad news for anyone waiting for HTC's smartwatch, though. That's been delayed until 2015. HTC made the first ever Nexus phone, and now it's back in the Nexus business with the Nexus 9 tablet, which is due for release in late 2014. With late 2014 approaching fast, details and photos are starting to leak - such as a glimpse at the case and rear camera. Apple's unveiling the iPad Air 2 next week, and it might just be the first iOS device with 2GB of RAM. Not only that, but it might just be the thinnest tablet ever at just 7mm thick. There could even be a gold one. Remember the Blackphone, the privacy-protecting Android tablet? It turns out that it's about to get a big brother. No, not that Big Brother. We mean a BlackPhone tablet. Speaking exclusively to Techradar, CTO Jon Callas explained that there are all kinds of BlackPhone devices coming soon. "This isn't our last phone and we're going to do a tablet," he said, explaining that there will be a variety of BlackPhone handsets to choose from. Would a mini Surface be a major mistake? The long-rumoured and oft-shelved Surface Mini tablet may be about to make an appearance, and Gary Marshall isn't sure that's a good idea. "Why release a device that's destined to fail?" he asks. Marshall reckons Microsoft should wait for Windows 10, which "addresses the fundamental problem with a Windows RT tablet, which is of course Windows RT". Plummeting profits, dwindling market share, bezel gaps big enough to stick cardboard into… is everything OK at Samsung? While Samsung hopes we'll all get excited about the Samsung Galaxy Alpha Gary Marshall investigates reports that Samsung's smartphone business is in trouble. While the big numbers are still big - "revenues and profits are still in the billions" - the smartphone market Samsung currently dominates is changing and becoming much more competitive. "It's not that Samsung got bad," Marshall says. "It's that everybody else got good." Tesla's just launched its next-generation electric car, the Tesla D. It reads road signs and adjusts its speeds accordingly. It can change lanes automatically. It can park itself when you get out. It will brake before it hits an object. In sum, it's really, really cool. The D stands for "dual motor", as it includes two motors to power both the front and back wheels, while the current Model S is only a rear-wheel-drive vehicle. In what's arguably the most useless hack since somebody put Doom on a laser printer, Corbin Davenport has got Windows 95 running on a Samsung Gear Live smartwatch. "Has science gone too far?" he asks. We'd say yes, but there is a serious point here: if you remember the price, weight and terrible battery life of Windows 95 laptops, the sight of the same operating system running on a watch shows just how far tech has come.